It's time we stopped being comfortably numb about the environment. Rock band Pink Floyd certainly isn't. Their latest album -- Echoes -- is primed to create four new forests in India (Bangalore), Scotland (Dryhope Burn), Mexico (Chiapas) and the US (Louisiana). The two-cd retro, comprising some of the group's greatest hits, will be made 'carbon dioxide (co2) neutral' with emissions arising out of its recording, production and distribution being offset by planting native trees in indigenous forests. The number of copies sold will be reflected in the number of trees planted. co2 is a greenhouse gas, which prevents heat from escaping the Earth's atmosphere causing global warming. Plants absorb co2 and turn it into oxygen and carbon. While oxygen is released into the atmosphere, carbon is stored in the form of wood. About 50 per cent of the tree's dry weight is due to carbon. Future Forests, a consultancy service, is assisting Pink Floyd in this initiative. It has measured the amount of co2 emitted during the production of this album, and estimated the number of trees to be planted to absorb an equal amount of carbon dioxide over their lifetime. The music industry has been among the first supporters of this four-year-old idea of Future Forests. Bands such as Atomic Kitten and Pet Shop Boys have also endorsed this eco-friendly method. 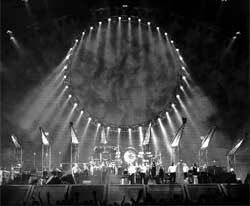 It seems the success of Pink Floyd's Echoes will benefit both us and them. They stand to make money. And we get to breathe easy.